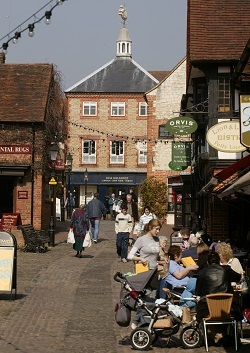 Our suggested day out takes in the historic highlights of Farnham, which can be found both indoors and out. There is also an opportunity to enjoy the North Downs Way National Trail through part of the Surrey Hills Area of Outstanding Natural Beauty. 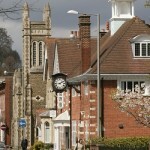 There are a host of other attractions around Farnham -see more suggestions below. 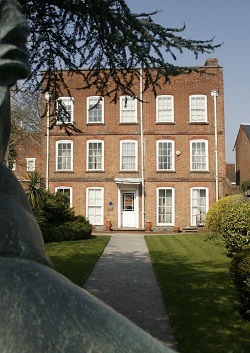 The Museum of Farnham is housed in a splendid Georgian house, at the far end of West Street, and is a good starting point for your day. Its stately rooms display and illustrate the town’s history and an audio tour guide of the displays is available free of charge. The Museum has an attractive walled garden, a well-stocked Local Studies Library for all your local history queries, a wide range of children’s activities and temporary exhibitions throughout the year. It is open from 10am to 5pm, Tuesdays to Saturdays. Admission is free. Walking from here towards the centre of town, turn up Castle Street and head to Castle Hill where you will find the magnificent Farnham Castle (open 2pm – 4pm every Wednesday), which overlooks the town. The Castle was home to the Bishops of Winchester for more than 800 years and guided tours are available on Wednesday afternoons. Alternatively, head to Farnham Castle Keep, now administered by English Heritage, which has an audio tour so you can discover its fascinating role in the Civil War. It is open to the public during the summer from April to September on Fridays, Saturdays, Sundays and Bank Holidays between 12 noon and 5pm. Those with young children may prefer to head out of the town centre to spend their day at The Rural Life Centre, a fun outdoor museum. Pleasantly distributed over ten acres of field, woodland and barns, the museum comprises a large number of implements and devices marking over 150 years of farming. Many aspects of village and rural life are also displayed in realistic individual settings. On Sundays and Bank Holidays, the Old Kiln Light Railway is in action providing steam and diesel hauled rides for visitors. Children love to play in the reconstructed village playground and there is ample room for family picnics around the site. The Rural Life Centre, which is on Reeds Road, between Tilford and Frensham, is just off the A287, three miles south of Farnham. Opening times are from late March to October, 10am to 5pm, Wednesday to Sunday and Bank Holidays; and in Winter Wednesdays and Sundays only, 11am to 4pm. 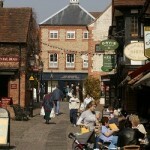 For those in Farnham’s town centre, you will be spoilt with a wide choice of cafes and pubs for lunch as well as a good choice of shops. 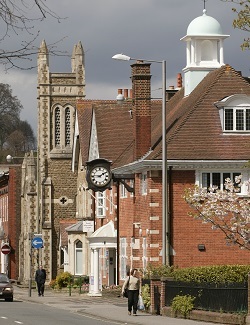 Head to South Street which is where the North Downs Way National Trail begins. The first stretch of the trail has stunning panoramic views over some of the most beautiful countryside and the ten miles walk from Farnham to Guildford will take you approximately four hours. It’s well worth visiting the ruins of Waverley Abbey. This was the Cistercians’ first English Abbey, but is a haunting ruin now. Situated about three miles south of Farnham station, along the B3001 road, Waverley Abbey was built in 1128. It was the foundation house in England of the new Cistercian order of monks, where manual work was encouraged and the Liturgy simplified. Waverley continued to grow until late into the 14th century, providing shelter for pilgrims and an infirmary for the sick. Unfortunately, the Abbey was not well endowed and was suppressed by Henry VIII in 1536. Afterwards, the Abbey became a convenient source of local building material. The resultant ruins provide a peaceful and picturesque spot. Entrance to this English Heritage site is free, and a small car park is provided. 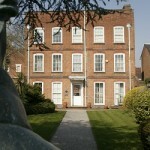 The Farnham Maltings (a community arts centre) has films, comedy evenings and gigs.